When navy first appeared as an alternative to black during winter 2012, I was sceptical. There was something a bit too ‘school uniform’ about it for me. I nervously tried navy with coral last Spring and was cautiously pleased with the results. But this year, I’ve come over to the charm of navy as a credible base colour – finally! So, here are a few of my favourite navy picks for Spring – Summer 2014. I cannot tell you how much I love this dress! I haven’t got a picture of me in it yet, but trust me, it is amazing. I popped into Yours in Bristol a couple of weeks ago in search of a summer jacket. I was pleased with the navy waterfall jacket I picked up, and only tried the dress on as a spur of the moment thing. Let me tell you, for £35, this dress is an absolute bargain! It looks much more expensive and sits perfectly on the waist. If you look closely at the picture, you can also see that there are very slight sleeves on the dress – these are subtle but cover that weird ‘arm meets torso’ bit in a very flattering way. This outfit would be perfect for summer occasion daywear – something like a wedding, a christening or even a special lunch. If the colour is a bit dark for you, Yours also do a similar dress with a different print, that’s got more white on it. But for me, the striped one wins on versatility. It can be tricky to wear navy casually without looking like you’re about to go off boating for the day. I wanted to get away from the typical nautical look and then I remembered that Simply Be had a gorgeous oriental patterned vest that I’d been looking for an excuse to combine in an outfit. 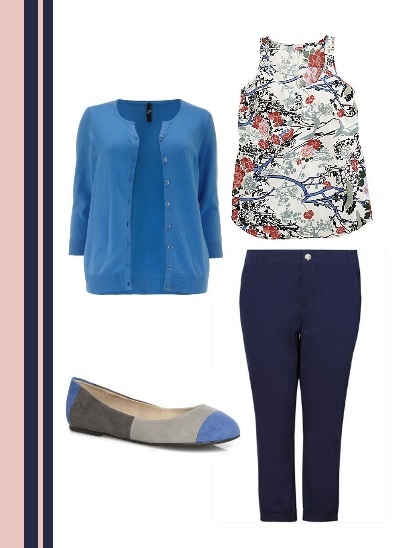 If you’re worried about navy looking a bit severe, then this outfit is for you – the softer blues and greys in the vest and cardigan are a bit less overpowering, and the flashes of coral and blush bring a little bit of brightness. I’ve combined the top and trousers here with a cardigan for a softer silhouette, but I think they would also look great with a denim jacket slung over the top. Then this look may be for you! I know what you’re thinking… that this dress isn’t navy at all. Well, it’s actually a very faded out shade, but the base shade is in fact navy (when you visit the Modcloth website you can zoom in and see what I mean). This dress would be perfect if you find full-on navy too heavy and overwhelming, and as with the oriental vest above, the coral stripes give it a bit of zing, as well as being a very wearable take on the orange trend that seems to be gearing up for the summer. Also worth knowing is that this dress is made of a cotton/linen blend, which makes it a very wearable option in warmer weather. 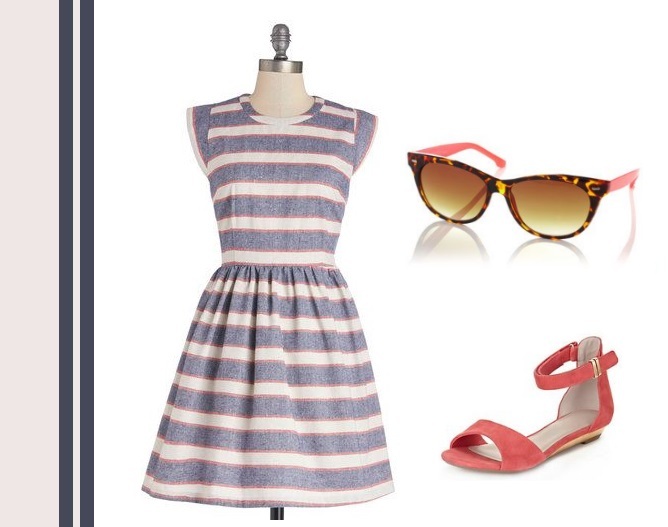 Modcloth is a US site, but they do offer delivery internationally, including to the UK. Shipping costs are very reasonable, with Savvy Saver delivery free on this dress, or it costs $14.00 for Express delivery, which takes 2-3 business days. Do be aware that you may need to pay customs fees on top of delivery charges though. So, have I converted you to navy? If you’re still not sure, why not take a look at my Return of the navy Pinterest board for more inspiration?